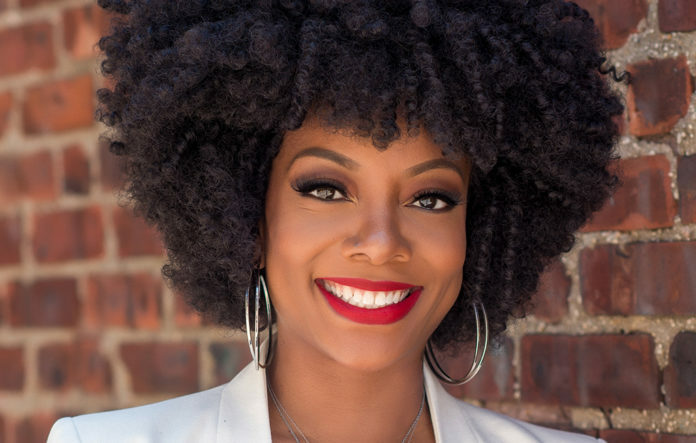 When Tracy Golbourne was not able to find the proper hair care products in the predominantly Caucasian area of Johns Creek, GA, she lived in, the financial analyst made a decision. She decided to make a major career change and start her own hair care business. She created “For ti fy’d Naturals.” And started the #HydrateYourCurls campaign to educate people about the difference between moisture vs. hydration. Golbourne started making hair care concoctions at home, doing research and testing. All of her products are natural and organic. Golborne tells TNJ how she built her brand and how she is making a breakthrough in an already crowded market. TNJ.com: Was it a big jump from the financial world to the world of hair care? Tracy Golbourne: The transition from the working in finance to producing Hair products was actually quite simple as I moved from finance to studying science which led to formulating the products. I also grew up with my father studying medicine so science was always a familiar thing to me. TNJ.com: How did your financial analyst background help you in your own business? Tracy Golbourne: As an analyst, my job function was to essentially manage the budget for an entity within the company I worked for. When started my own business I was able to forego hiring an accountant because I was able to keep my own books and manage my own budget which saved me a lot of money on professional expenses. TNJ.com: What was the riskiest part of entering into entrepreneurship? Tracy Golbourne: The riskiest part of entering into entrepreneurship for me was not knowing if my decision would negatively affect the lifestyle of my family and there was a major struggle within whether to continue in a path that was familiar and had been reliable or to step out and do something that I felt led to do. TNJ.com: How has social media helped your business? Tracy Golbourne: To date 100% of my sales have been attributed to social media. I would not be able to reach as many people as we do without social media since we do not have a physical store location. We have acquired all of our customers, including the stores that currently sell our products using social media. TNJ.com: Why did you start the #HydrateYourCurls campaign? Tracy Golbourne: Even with so many products on the market, the problem still remains that women are struggling with dry hair. The #hydrateyourcurls campaign is an effort to show women that there is a better way to acquire what their hair needs and to help them understand the difference between a moisturizing ingredient and a Hydrating ingredient when it comes to hair care products, which will end their struggle with dry hair. TNJ.com: Had you ever created any homemade beauty products before? Tracy Golbourne: Prior to formulating For.ti.fy’d Naturals products, the only other homemade beauty products I’ve made were whipped butters for skin care which requires no true knowledge. TNJ.com: What was the most surprising thing about making your own beauty products? Tracy Golbourne: The most surprising thing I’ve found is that changing one step or not combining the ingredients in a specific way can change the outcome of the entire formulation. TNJ.com: Can you explain True Hydration Technology? Tracy Golbourne: True Hydration technology is the term I use to describe our Hydration process which is using natural ingredients whose molecules are small enough to penetrate the structure of the hair strand. This requires that the ingredients molecules be less than 18 to 20 carbon atoms. Doing this means that both oils and water are penetrating the strand so that when water evaporates the oils will remain in the strand for up to a week resulting in softer and shinier hair for a longer period of time. Hydration is sealed using butters in the formulation instead of film forming ingredients that create buildup that can keep hair dry. We also use an ingredient that combats hard water to ensure nothing gets in the way of the Hydration process. TNJ.com: Did you create this? Tracy Golbourne: Yes, I created the term and the actual formulations. TNJ.com: Why was it important to have a 5-product system? Tracy Golbourne: In my opinion, when it comes to hair care, less is more. All of the necessary benefits can be put into just a few products which makes hair care less of a financial undertaking for naturals since hair products can be quite expensive. TNJ.com: Why an hour or less? Tracy Golbourne: When I first went natural, I had a newborn baby and didn?t have much time to spend on my hair. I found that doing my hair took way too much of my time. I thought back to having relaxed hair when it took about 40 minutes to get my hair washed, conditioned and roller set. I ?wanted to offer naturals the best wash day experience and wanted to be sure the products were fully effective and capable of performing in the minimum amount of time. TNJ.com: Is everything still handmade products? Tracy Golbourne: Each product is still handmade. Tracy Golbourne: To make more naturals aware of the science of hair so that they can become better informed consumers, knowing how products not only affect their hair but health as well. TNJ.com: Most important business lesson you have learned? Tracy Golbourne: The most important business lesson I’ve learned is to stay focused on what you’re doing and not pay attention to what anyone else is doing in order to stay true to your vision. People will tell you what you should be doing and you’ll see others doing things that may not be in line with your personal vision and if you’re not focused it will make you begin to doubt yourself which can create a major delay in your success.